The Bulldogs have made five changes to their lineup for the Elimination Final against the Eagles tonight, while the Eagles have only made one change. Based on that, which team should we expect to win? Do teams that make more changes – the Dogs in this case – tend to lose? The answer is ‘yes’, but it’s a very tentative answer. On average, teams that make only one change to their lineup have a winning margin of 5.93. I calculated this average by looking at all games played since 1990, other than the first game of the season for each team. Meanwhile, teams that make five changes to their lineup have an average margin of -8, a losing margin. That should give Eagles’ fans some cheer, right? But not so fast. There’s a large range of variation in these numbers. 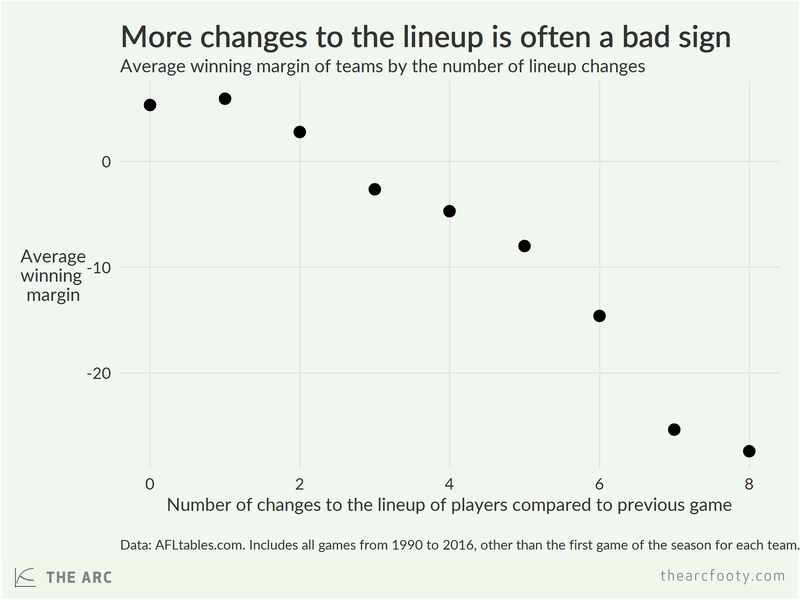 A lot of teams have made a large number of changes to their lineup and still won their game, while a lot of teams have made no changes or one change and lost their game. In general, I think it makes sense to interpret a large number of changes to the lineup as a bad sign. 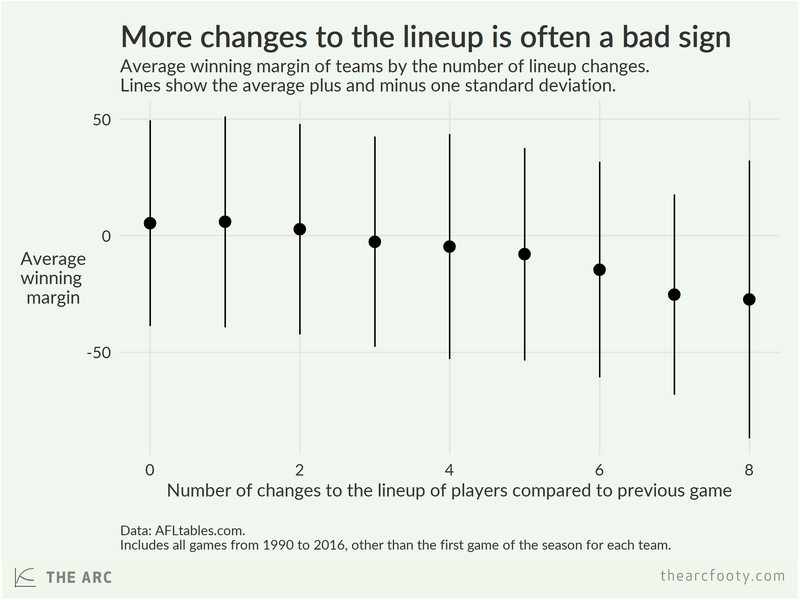 Lineup changes are often made due to injuries or form slumps. But there are plenty of examples of teams making five changes to their lineup, like the Dogs have done, and winning the game. Note: I’ve made no adjustment to these figures for the strength of opponents, or anything else. These are just simple averages. This is, I think, an interesting area to look into further. Previous article	← How does your club’s age profile compare?